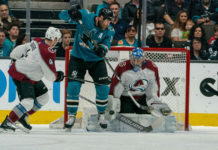 The Colorado Avalanche fought their way back into the series against the Nashville Predators with a gritty 5-3 victory at home in front of a rowdy Pepsi Center crowd. Nashville still leads the opening-round series, 2-1, with Game 4 set for Wednesday in Denver. The Predators still do not have an answer for the Avs’ top line. They controlled the play all night, and even the best defense in the NHL is having a tough time keeping up. The remarkable thing is that they’re still dominating, even though Mikko Rantanen is having issues controlling the puck against the physical Predators’ ‘D’. Right now, it’s the ‘Nathan MacKinnon & Gabriel Landeskog Show’ — and Nashville still has no answer. Landeskog is playing like a man on a mission. His hard work in the neutral zone led to a nifty pass that sprung MacKinnon for a breakaway in the second period, and the Swedish winger led the team all evening. He finished the game with a goal, two assists, four shots on goal, and five hits. 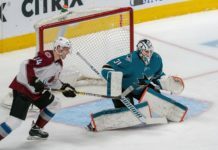 Without Samuel Girard, the Avalanche are relying heavily on their top four of Tyson Barrie, Nikita Zadorov, Patrik Nemeth and Mark Barberio. All four of them played over 20 minutes, while neither of the bottom two defensemen (Duncan Siemens and David Warsofsky) even reached 10. They held up well enough Monday night, but Girard’s return to the lineup would be a huge boost. 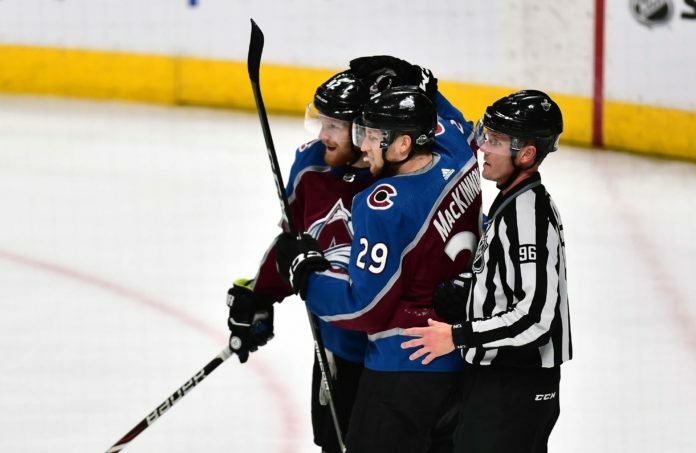 The Avs’ fourth line has been in a state of flux all season, rolling through different players over the course of the season, but the trio of Gabriel Bourque, J.T. Compher and Colin Wilson have found some chemistry. They’ve been tremendous in all three games, and chipped in another goal in Game 3. Their scoring punch has been a huge boost for a team in need of secondary scoring. If the Avs are going to come back and win this series, they’re going to need the power play to pick it up. 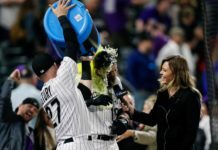 They were not able to convert on any of their five chances on Monday, and missed out on a chance to end this game early. They didn’t end up needing a goal from the man-advantage tonight, but it will certainly be necessary to take advantage of those situations if they’re to rally and defeat the league’s best team.